The collection industry is not immune to the effects of evolving technology. Answering machines and cell phones have altered communication strategies for agents attempting to reach their debtors, and made the waters of debt collection murkier than ever. Leaving collection messages may open collection agencies to liability. Because of this, some collectors are now unsure of how to get debtors to return their calls while remaining compliant with regulations. 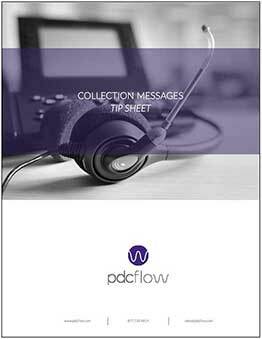 Download this Tip Sheet detailing what your collectors should consider when deciding to leave a message and the pros and cons of the FOTI and Zortman messages. The information provided comes from members of the California Association of Collectors as provided in their webinar series: Collection Boot Camp. To view the full article based on their presentation, please see Collection Boot Camp: Leaving Messages.